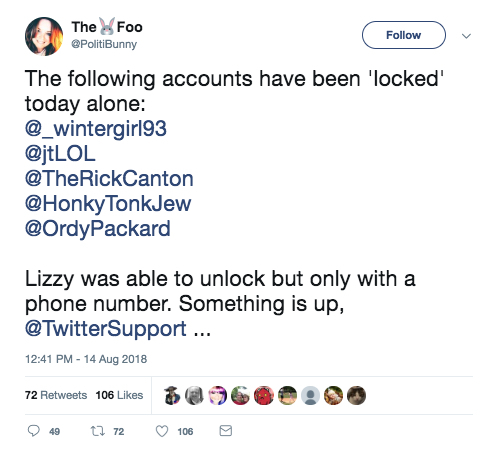 Twitter’s “Trust and Safety” team is allegedly working to ban conservatives, resulting in multiple 12-hour bans on right-leaning accounts Wednesday. “What rule did I break? I have no idea, and apparently they’re not going to tell me. How do I avoid breaking that rule again? Beats me. It’s tough to avoid repeating the infraction if I don’t know what it was,” wrote PJ Media’s Jim Treacher. 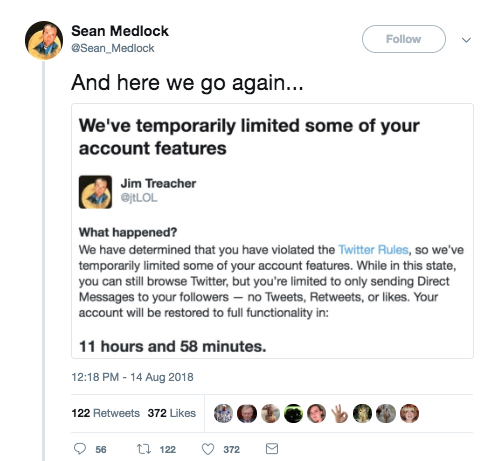 Treacher added that he saw several non-liberal handles temporarily suspended or locked out of their accounts Wednesday, some of whom work at conservative-leaning media outlets. Republican Rep. Devin Nunes of California said July 30 he was looking into taking possible legal action against Twitter for effectively censoring conservatives, The Daily Caller News Foundation reported. Shadow-banning even caught the attention of President Donald Trump — who would cost Twitter $2 billion if he decided to stop tweeting, according to Bloomberg. “Twitter ‘SHADOW BANNING’ prominent Republicans. Not good. We will look into this discriminatory and illegal practice at once! Many complaints,” the president tweeted July 26. Twitter, for its part, denies it shadow-bans conservatives. TheDCNF reached out to Twitter for comment and will update this article if and when a response is issued.